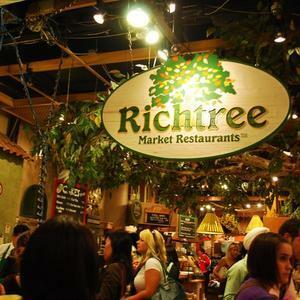 Richtree Market is a Canadian restaurant chain, which approximates the style of a European market. Richtree Market Restaurants Inc. operates market-style, open-kitchen restaurants. The company has three owned-and-operated locations in Toronto, Ontario, Canada, and one in Thornhill, Ontario, Canada. Franchises exist in Mississauga, Ontario, Canada, and Ottawa, Ontario, Canada. The chain offers casual dining and takeout service, with limited grocery stores and special items for children. Menu items are inspired by foods of Europe and Asia. Locations seat approximately 50 people. A larger, downtown-Toronto location, at Brookfield Place (formerly BCE Place), went out of business in January, 2010. A similar restaurant, which opened in the location after Richtree's closure, is owned by competing Swiss chain Mövenpick Marché and is unrelated. Richtree has announced plans to open one new location in Chicago, Illinois, in the Westfield Old Orchard Mall. It would be the chain's first venture outside of Canada. Richtree prohibits customers from using cameras in its dining rooms.